The adult and third instar of a new genus and new species of leucochrysine green lacewings, Santocellus atlanticis gen. et sp. nov., are described from Brazil's Atlantic Forest. The first instar of Santocellus riodoce (Tauber) comb. nov. (formerly Leucochrysa riodoce) is also described. These two species share a distinguishing suite of adult and larval features: wings with dark (sometimes pustulate) markings; male with an elongate, cylindrical mediuncus and stiff membrane below; female with round, doughnut-shaped spermatheca having a shallow invagination and a sail-shaped velum that extends anteriorly; larvae with discrete, longitudinal head markings, short mandibles, broad labial palpi, and short, stubby, ventrally projecting terminal palpomeres. With this new genus (Santocellus gen. nov.), the number of genera in the tribe Leucochrysini increases to seven; Santocellus gen. nov. includes three described species: S. atlanticis sp. nov., S. riodoce comb. nov. (both from Brazil), and Santocellus bullata (Tauber) comb. nov. (from Peru). 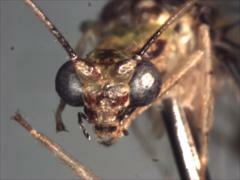 O adulto e a larva de terceiro instar de novo gênero e nova espécie de crisopídeo leucocrisíneo da Mata Atlântica do Brasil, Santocellus atlanticis gen. et sp. nov., são descritos. O primeiro instar de Santocellus riodoce (Tauber) comb. nov. (anteriormente Leucochrysa riodoce) também é descrito. Estas duas espécies compartilham um conjunto distintivo de características tanto do adulto como da larva: asas com manchas escuras (algumas vezes pustulosas); macho com mediuncus cilíndrico, alongado, com membrana rígida ventralmente; fêmea com espermateca arredondada, em forma de rosca, com uma invaginação rasa e com o velum grande, em forma de vela, estendendo-se anteriormente; larvas com manchas cefálicas separadas, alongadas longitudinalmente mandíbulas curtas, palpos labiais largos com palpômeros terminais curtos, grossos, projetando-se ventralmente. Com este novo gênero (Santocellus gen. nov.), o número de gêneros da tribo Leucochrysini aumenta para sete; Santocellus gen. nov. inclui três espécies descritas: S. atlanticis sp. nov. e S. riodoce comb. nov., ambas do Brasil, e Santocellus bullata (Tauber) comb. nov., do Peru. Note: The color variation in the external views of Santocellus atlanticis and S. riodoce adults is the combined result of aging (yellowing of green areas) and differences in the light sources for the various photographs. The true background color of S. atlanticis adults is a relatively bright green (as in images M27160, M27164, M27166); that of S. riodoce is slightly more yellowish. The true color of S. bullata adults is unknown. The images and information in this project were obtained, in part, with the support of NSF (Grant DEB-0542373, CAT, MJT) and CNPq (475848/2004-7, GSA). Project has no matrices defined.